The VEGAPULS 61 radar sensor is a continuous level measurement for liquids under simple process conditions. The VEGAPULS 61 is an economical solution through its simple and versatile mounting possibilities. The encapsulated antenna system ensures a maintenance-free operation. The version with encapsulated antenna system is particularly suitable for level measurement of aggressive liquids in small vessels. 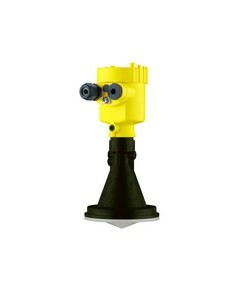 The version with plastic horn antenna is particularly suitable for flow measurement in open flumes or gauge measurement in waters. The radar gauge VEGAPULS 61 is in use everywhere where the level of liquids in tanks has to be measured continuously and contactlessly. Application possibilities for radar gauges can be found in almost all areas of industry. Sewage treatment plants and water purification plants in particular, but also other environmental engineering facilities as well as power generating stations now rely on cost-effective radar sensors for continuous level measurement.